"This is a great recipe for a Chilean bread. They are so easy, ready in a few minutes, and taste heavenly. They are best when they are warm, right from the oven or toasted the next day, with some butter, jelly, or even some guacamole." Preheat oven to 450 degrees F (230 degrees C). Grease a baking sheet. Stir together the flour, salt, baking powder, milk, and 1 cup of melted butter. When the dough begins to pull together, turn it out onto a lightly floured surface; knead until smooth and elastic. Roll out the dough to 1/8 inch thickness and cut into 8-inch circles. Brush the circles with the remaining melted butter. Fold each circle in half and then in half again, into triangles; press firmly to seal the layers. Place the rolls on the prepared baking sheet. Bake in the preheated oven until golden brown, about 15 minutes. Serve warm. My family, especially my mother loved this recipe. Very good to serve with salsa. Muchas gracias, Barbara! 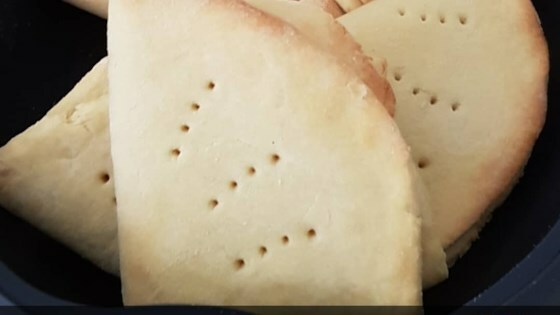 I'm Chilean, and I can tell you that this dobladitas are the best that I have ever tasted. Thank you! Dough is much easier to knead if you use the full cup of melted butter and between 1/2 and 2/3 cup of milk. Really easy to make and tastes awesome.